The Bayview Eden Melbourne overlooks the trees and lakes of verdant Albert Park, yet is near the centre of Victoria’s vibrant state capital. For sightseers, it’s a short walk to the Royal Botanic Gardens, while business visitors can access the Melbourne CBD in 10 minutes. Local sports facilities include the 18-hole golf course and running track in Albert Park. Families enjoy the nearby sandy beaches of St. Kilda and the fun-filled rides at Luna Park. Melbourne is known for its buzzing shopping at Chapel Street and Queen Victoria Markets, and night owls appreciate the cosmopolitan bars in Southgate and Southbank. When you’re staying at the Bayview Eden Melbourne, the city is on your doorstep, and discovering it is affordable as it costs just AUD 7.50 for unlimited travel on all Melbourne public transport. Around 50 international airlines fly to Melbourne Airport (MEL), known locally as Tullamarine. Domestic travellers can connect with major Australian cities such as Sydney, Darwin, Perth, Adelaide and Brisbane on 8 airlines including Qantas, Virgin Australia and Jetstar. 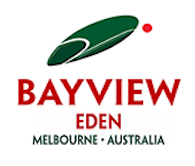 Bayview Eden Melbourne is a 35-minute drive south of the airport, and you can make the journey by chaufferu-driven car, taxi or public transport. Hotel staff can arrange for you to be met from your flight by chauffeur-driven car. Just let us know your flight number and time of arrival, and we’ll do the rest. Metered taxis are available from ranks outside Terminal 1 and between Terminals 2 and 3; the fare to the hotel is about AUD 75, depending on traffic. Cars rental is available at Melbourne Airport from 6 international hire firms, with offices on the ground floor of Terminals 1 and 2 and in the car park of Terminal 3. It’s a well-signposted, 35-minute drive to the hotel from Melbourne Airport in the north of the city. Take the Tullamarine freeway M2 on to the CityLink (tolls of AUD 8.53 apply, paid by electronic tokens in hire cars) and follow it across the Bolte Bridge over the Yarra River, taking exit 2 on to Kings Way. As Kings Way turns right into Queens Road (National Highway Alt 1), the hotel is the second building on the left after the Toorak Road turning. The hotel has secure parking for 170 cars, costing AUD 14 per day. The Starbus airport shuttle brings you directly to the hotel in about 50 minutes, with fares costing 25 AUD per person. Buses operate between 5 AM and 9 PM daily and need to be booked in advance; on arrival, call +61 03 8378 8700 once you’re through passport control. Click here for more information on the Starbus airport shuttle. The SkyBus Frankston & Peninsula Airport Shuttle (FAPAS) express service runs between the airport and the Mercure Melbourne Albert Park stop, a 20-minute walk from our hotel. It operates daily from Terminal 4, running every 30 minutes from 6 AM – 7 PM. Buy your ticket on the bus; AUD 19 for an adult one-way ticket. From Flinders Street station, tram numbers 3, 5, 6, 16, 64, 67 and 72 run to St. Kilda Road behind the hotel; the fare is AUD 3. Alternatively, a taxi from the station takes 10 minutes and costs AUD 14.